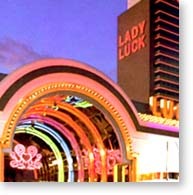 If you are looking for something in the downtown area, try the Lady Luck Casino Hotel located 1/2 block from the exciting Frement Street Experience. An excellent downtown hotel with 792 rooms and suites, over 800 slot machines, a variety of table games, 4 restaurants including gourmet dining in the Burgundy Room and a Prime Rib Buffet, outdoor swimming pool, live entertainment and 24-hour room service. What more can you ask for.